Hello world! Today is the official first day of summer. I am reposting this composition. Collingswood is a beautiful town with a perfect Main Street to stroll along. On Saturdays in the early morning is a vegetable market with other food vendors until 12:00 pm. Afterwards, there’s their Main Street called Haddon Avenue to explore. Love, the the Ice Cream shop! Another favorite shop of mine is the Painted Cottage, antique furniture like dressers, armoires, desks, that have been repainted shades of white. 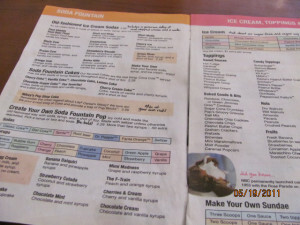 Today is National Ice Cream soda day and the one place I wish that I could be now is at the Pop Shop . 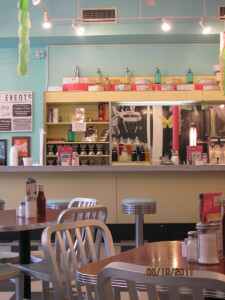 It is a cafe and creamery designed like an old fashioned soda shop. Here’s some photos of our recent first vist in the month of May. Among the choices, there’s a a Black Cow, a Brown Cow and an Orange Cow. There’s create your own Soda Fountain pop, made with soda ( seltzer) , syrup and a shot of fizz. The flavor choices are : Banana, bubblegum, cherry, chocolate, cupcake, coconut, green apple, grape, raspberry , peach pineapple, mint , strawberry, vanilla, and an unknown because only half the word is in the photo.